When Dan Vance decided to make “Cold Day in Hell”, an independant Sci Fi feature, he wanted a tapeless digital camera. Instead of paying big bucks for an advanced HD Cam from Sony or without waiting for The RED digital camera, Dan made his own. 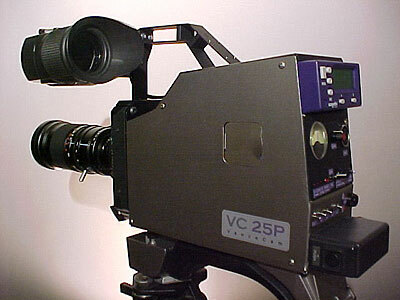 The VanceCam VC25P Camcorder is a 25 fps progressive scan digital cinema camera that records to a hard drive. Based on a Hitachi HV-C20A/E 1/2″ 3 CCD format with 700 lines of resolution The VanceCam uses a mechanical shutter and the component signals from the camera are fed through an analog component-to-firewire converter (ADS Pyro A/V link) which feeds the DV signal directly to a Laird CapDiv hard disk recorder, for a tapeless system. This is a Geek masterpiece, I wish I had thought of the idea. Well done Dan Vance, you are PhotoGeek of the week. I have some sheetmetal and some tires…, wonder if Dan would be kind enough to build me a new car….,with genuine kangaroo leather seats?